Thankfully, the deck is massively stacked in our favor. You are not controlled by the sinful nature but by the Spirit… if Christ is in you, your body is dead because of sin, yet your spirit is alive because of righteousness. If the Spirit of him who raised Jesus from the dead is living in you, he who raised Christ from the dead will also give life to your mortal bodies through his Spirit who lives in you. (Romans 8:9-11) Daily partnership in the process is the key to keeping our advantage. Therefore brothers, we have an obligation, but it is not to the sinful nature, to live according to it. If by the Spirit you put to death the misdeeds of the body, you will live, because those who are led by the Spirit of God are sons of God. You received the Spirit of adoption, and by him we cry “Abba Father.” (8:12-15) Even though this is MY obligation, I do it “by the Spirit”, drawing power from the spiritual turbine within me – the Spirit of son-ship (adoption). A great companion to Romans eight is First Corinthians chapter fifteen and the theme of “natural body and spiritual body.” The first man Adam became a living being; the last Adam, a life-giving spirit. The first man was of the dust of the earth, the second man from heaven. Just as we have borne the likeness of the earthly man, so shall we bear the likeness of the man from heaven. (15:44-49) Every new creature in Christ is a miracle and proof positive that the last Adam indwelling us, is indeed a life-giving spirit! Yet we are not completely free from the pull of sin’s gravity. 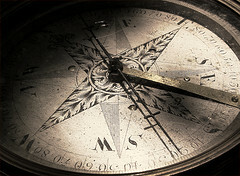 We have an internal compass, guiding us away from the deceitful luster of the world. It’s the internal mediation of the Holy Spirit, leading us to walk in freedom, abiding in Father’s love, doing the will of God. This is, life and peace. I read this several times but it really makes sense. I embrace your Bible based teachings and hope and believe I can apply them in my life every day. God does give us supernatural desire (the very working of the Spirit of God living inside of me for if we have born again through the Spirit He lives IN us!) for the things of God and as we choose those things we do put to death the members of our flesh. It’s a constant choice. Every minute we are either dying or living. Thank you for all you do and share for the sake of the Gospel!